Jim Kennedy is passionate about kayaking. He has raced on the Irish national kayaking team at two sprint and two marathon world championships and is a level 5 Irish Canoe Union sea kayak instructor/coach. He has been Irish and British national sprint and marathon kayak champion both 500 and 10,000m. Recently he was picked as an Ambassador for Ireland’s Adventure Tourism and the Wild Atlantic Way. So where’s the romance? Ever fancy a romantic kayaking trip to a deserted island and share a picnic with your loved one or float on the calm water on a moonlight/starlight kayak trip then sip a glass of champagne? 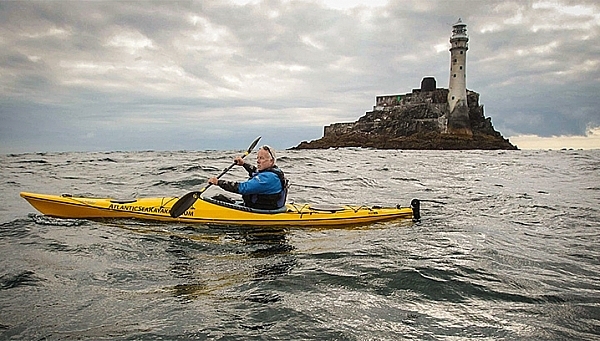 Here are a couple of trips offered by Jim and Atlantic Sea Kayaking. Using our double kayaks we bring you both on a 4 hour romantic journey along the coast stopping off at an island where you can enjoy the isolation and the amazing scenery while sharing a delicious artisan picnic with your favourite person. Times to be confirmed but usually 12.00 noon to 4.00pm. Special rates for Cottages for Couples guests. Or if you would like something even more different then a night trip is the one for you. Again using double kayaks we drift quietly under the stars and soak in the magic of a West Cork sky. We will spoil you here with locally made chocolates and a glass of champagne. Times to be confirmed but usually 5.30pm to 8.00pm. Special rates for Cottages for Couples guests.